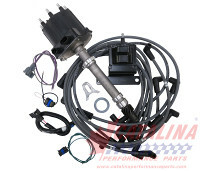 Distributors: 10457092/3 - Chev 350-502 Kit, complete with Dist., Coil, High Tension Wires, Patch Leads & Installation Manual. Everything except the Spark Plugs. from California Marine. Description Chev 350-502 Kit, complete with Dist., Coil, High Tension Wires, Patch Leads & Installation Manual. Everything except the Spark Plugs. Delco Voyager Marine Distributor Ignition System with EST accomplishes the spark timing function electronically. This results in longer spark plug life, eliminates mechanical contacts and scheduled maintenance, provides better cold weather starting, and is environmentally protected. EST achieves new standards of distributor ignition performance by providing 40% more output voltage and 85% higher energy level. With higher energy available, combustion is more reliable and complete.